It's expected that efforts to form a power-sharing administration will begin early next week. Northern Ireland's snap election has significantly altered the make-up of the Stormont Assembly, with nationalism making major strides at the expense of unionists. In a dramatic shake-up, unionists have lost their long-enduring and highly-symbolic overall majority in the chamber. 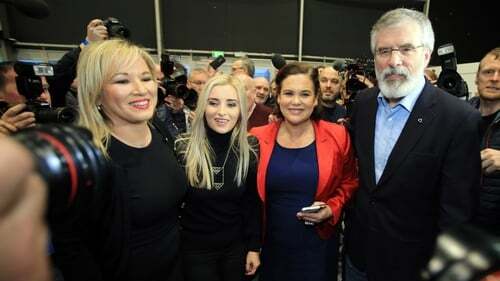 Sinn Féin's vote has surged and the republicans came within one seat of drawing level with the DUP - a party that came into the snap election holding ten more seats. The DUP finished the night with 28 seats after the election of Christopher Stalford in Belfast South, with Sinn Féin returning 27 MLAs. The SDLP has also done better than many expected, replacing the Ulster Unionist Party as the third-largest party in the Assembly. The final result leaves 40 unionists and 39 nationalist/republicans, with the remainder of the 90 MLAs affiliated to neither tradition. Ulster Unionist leader Mike Nesbitt announced his resignation after his party suffered losses in a poll he predicted would deliver big gains. While Mr Nesbitt held his Assembly seat, other high-profile MLAs were not so lucky. The SDLP's Alex Attwood, the UUP's Danny Kennedy, and the DUP's Nelson McCausland and Maurice Morrow were four former Executive ministers who failed to secure a return to a Stormont legislature that is being cut from 108 to 90 members. Away from Mr Nesbitt's dramatic announcement, the story of the election was the surge in support for Sinn Féin. The republican party came extremely close to securing more first preference votes than the long-time largest party, the DUP. While the DUP saw its vote dip, the travails of the UUP means it still reaffirmed its position as the main voice of unionism. Sinn Féin's Stormont leader Michelle O'Neill said: "I think it's a brilliant day for equality, I think it's a great day for democracy. "I want to particularly commend all of our candidates that have been elected. "The vote has increased. I think that is because people knew that action needed to be taken, they have had their say, we now need to get down to the business of fixing what's wrong and delivering for all citizens." The poll was forced after Sinn Féin pulled the plug on the power-sharing institutions in protest at DUP first minister Arlene Foster's handling of a botched green energy scheme - the Renewable Heat Incentive (RHI). The campaign exposed other major policy disputes between the parties. After being elected in her Fermanagh and South Tyrone constituency, Ms Foster said: "I think it's very clear that was absolutely not about RHI, it may have been the excuse but it certainly wasn't the cause of the election. "The cause of the election was Sinn Féin and republicanism wanting to rerun the election, they have mobilised their vote in a very effective way. "I am pleased that the DUP has come out as the largest party in terms of votes. It is very clear in terms of unionism that it is the Democratic Unionist Party that speaks for unionism." She added: "I do hope devolution will get back up and running as quickly as possible." The DUP and Sinn Féin will have three weeks to resolve their multiple differences and form a new administration. The reimposition of direct rule from London is on the cards if the post-election talks fail. If the three-week post-election deadline passes, Northern Ireland Secretary James Brokenshire is legally obliged to call yet another election. However, in those circumstances, the British government may pass emergency legislation to suspend devolution for the first time in ten years ahead of more lengthy negotiations. His elimination followed the loss of another Stormont veteran - the SDLP's Alex Attwood in west Belfast. SDLP leader Colum Eastwood said Sinn Féin were the "net beneficiaries" of a huge nationalist turnout intent on punishing Ms Foster. "The Sinn Féin vote has gone up very highly, which is a result of the overall context of this election, which has been pitched as a battle between the DUP and Sinn Fein," he said. "Those of us in the middle have been clearly squeezed." One of the most significant moments of the furore around the Renewable Heat Incentive was when former DUP minister Jonathan Bell broke party ranks to level a series of explosive allegations against Ms Foster and party special advisers - accusations they denied. He was subsequently suspended by the party and stood in the election as an independent in the Strangford constituency. It was a move that did not pay off, as he was eliminated at count seven of today's count.